Beyonce Knowles As Wonder Woman? 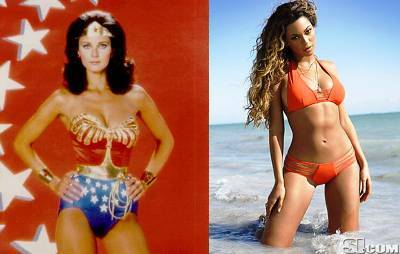 Beyonce thinks she should be wonder woman. “A black Wonder Woman would be a powerful thing. It’s time for that, right?” Knowles says in an interview with the LA Times. So…what…a black man becomes President and now Beyonce Knowles, oh excuse me, I mean Sasha Fierce, thinks she should be Wonder Woman? And what does Beyonce think qualifies her to be the awesome Wonder Woman? She filmed a fight scene with Ali Larter in some movie called Obsessed. I’m sorry, maybe it’s just me, but when I think of Beyonce Knowles the actress, I think of Foxy Cleopatra from the third Austin Powers movie, and that doesn’t really scream superhero to me; although I can totally picture Beyonce spinning around and around and around. Actually, you know, now that I think about it, she would fill out the costume nicely – except for maybe the tiny waist part. next post: Brian Epstein Met The Beatles Today. Time for what, a minority to play a classic comic superhero? It’s never been done before. If only Linda Carter were Hispanic…oh, wait, she was! Let’s get over this color stuff, before it covers us all over with 6 ft of dirt. 53 queries in 0.589 seconds.